I am Woman Hear Me Screech! On June 8th, 1941, President Franklin D. Roosevelt went before Congress to ask for a Declaration of War against Japan. His opening sentence was “Yesterday, June 7th, 1941, is a day that shall live in infamy.” President Roosevelt had the day correct, but he was off by 75 years. 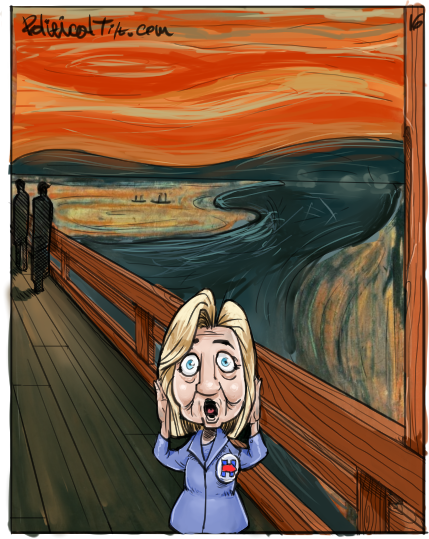 History will now reflect that ‘June 7th, 2016, is a day that will live in infamy.’ On this day, the record will show, Secretary Hillary Rodman Clinton Rodman (HRCR) finally completed the rigged democrat primary and caucus process and extinguished Senator Bernie Sanders (The Bern) and limped across the finish line dragging super delegates with her. As a current events side note, June 7th, 2016, is also the day the State Department announced, at current staffing levels, that it would take 75 years to complete a through inspection of her emails before they could be released to the unwashed masses (citizens). Yes, they assured us that the release of her emails from her private server that may, or may not, contain highly classified government secrets will be ready for inspection in 2091. (They did not give a month). After Secretary HRCR had the necessary number of delegates to secure the nomination, it was time to assemble her staff, the mainstream media (democratic stenographers) and paid crowd members to cheer widely at her every word. The setting was perfect. American flags everywhere. All Mexico flags used for Trump rallies were locked away. The lighting was professional and showed off her $12,000 Chairman Mao pantsuit with glamor. It was now time to crank up the Teleprompters and let the show begin.